You might want to split a cell into two smaller cells within a single column. Unfortunately, you can’t do this in Excel. Instead, create a new column next to the column that has the cell you want to split and then split the cell. You can also split the contents of a cell into multiple adjacent cells. Select the cell or cells whose contents you want to split. Important: When you split the contents, they will overwrite the contents in the next cell to the right, so make sure to have empty space there. On the Data tab, in the Data Tools group, click Text to Columns. 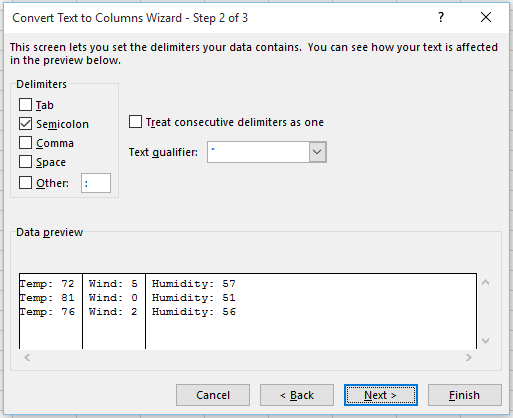 The Convert Text to Columns Wizard opens. Choose Delimited if it is not already selected, and then click Next. Select the delimiter or delimiters to define the places where you want to split the cell content. The Data preview section shows you what your content would look like. Click Next. In the Column data format area, select the data format for the new columns. By default, the columns have the same data format as the original cell. Click Finish.